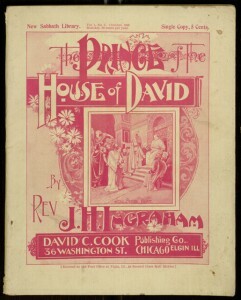 Before dime novelist Prentiss Ingraham was writing adventures like Wizard Will the Wonder Worker, his father Reverend J. H. Ingraham published a number of successful religious novels. Our latest Distributed Proofreaders project is one of these tales, an epistolary novel called The Prince of the House of David. The particular edition we are using as the basis for this project comes from Chicago-based publisher David C. Cook’s New Sabbath Library, a series of inexpensive editions of religious novels sold by subscription. To help make this once-popular book available again in convenient electronic formats, first read about the proofreading process here, then join in at the project page.